*AoV2-139 / GA525 / SP&P045 Gather us O God Body spirit soul and mind (Brown) Very simple song. Would work well as a gathering chant "Gather us O God, Body, spirit, soul and mind. Gather us, O God, One in union now with you. 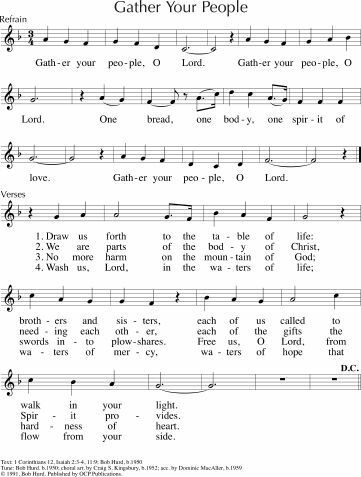 Also works at the end of the service "Send us out O God..."
MV007 Gather us in ground us in you (Hann) A simple chant which would be great for an invitation to worship. TiS 647 / AoV2-012 / ATN 25 / STB184 Comfort comfort all my people (Mann) This is one of my all time favourite songs. Easy to sing, beautiful lyrics. Chorus is “Comfort, comfort all my people, with the comfort of my word. Speak ye tender to my people, all your sins are taken away”. Lyrics and mp3. Iona (There is one among us) Lord you can turn all mourning into dancing (Bell) An excellent simple refrain “Lord you can turn all mourning into dancing, evenings of grief to mornings of great joy”. Tune In You in all our worries / All will finish well (Brown) “In this world where injustice reigns, you are in the midst of pain”. Excellent words of reassurance in a difficult world. Sound sample, lyrics and songbook available here. *MV010 / GtG174 / URW099 / VF060 Come and seek the ways of wisdom (Ruth Duck) This song is more about the personification of Wisdom, but would work very well as a gathering song in the context of this reading. The tune in MV and GtG is a joyful 6/8 tune, but not familiar, so if it seems difficult, you could sing the same words to PICARDY (TiS 497). VF has a more challenging tune, which may be a bit tricky for a congregation. Lyrics. *CH604 Holy wisdom lamp of learning (Duck) Great words seeking wisdom, judgement, and celebrating a searching faith. Sung to a good joyful and easy hymn tune (IN BABILONE). Could also be sung to BEACH SPRING. Sample music and lyrics. *URW206 In her house there is a table / Wisdom's Table (Gay) Sung to BEACH SPRING, this song has great words of being welcomed by Wisdom at her table through times of trouble. *HiOS156 Wisdom be our guide (Murray) Inspiring lyrics of peace and being grounded and inspired by Wisdom. The tune is quite simple, and the chorus will be easy to follow. *TiS 418 / AoV2-075 / Iona (EoA, Common Ground) / CH593 / GA372 / A&M259 / Cha255 / SP94 / URW165 / Lau305 She sits like a bird brooding on the waters (Bell) Beautiful words and very easy to sing, provided it is not played too quickly The Iona recordings are generally very quick, but there are a lot of words to fit in, so keep it elegantly moderate in speed! Lyrics (scroll down). *ATE 216 / Iona (SBL) / CH126 / VU241 / StJ / ELW555 / GtG637 / PH472 / G(II)365 / GC527 / RS 671 O sing to the Lord / Cantai ao Senhor / Cantad al Señor (Traditional Brazilian) A good, fun and simple song that is easy to learn in Portuguese or Spanish too. Some versions also have multiple verses (e.g. CH). Sound sample (click on the play button). *TiS 706 / Taize / AoV2-142 / A&M600 / SFFS 2013 / GtG544 / PH224 / GC(II)576 / G(3)620 / CP360 / PfAS103C / SP194 / Src79 / URW377 / Lau813 Bless the Lord my soul (Batastini / Taize) A beautiful and very well known Taize chant. Sound samples, sheet music.Good for kids. 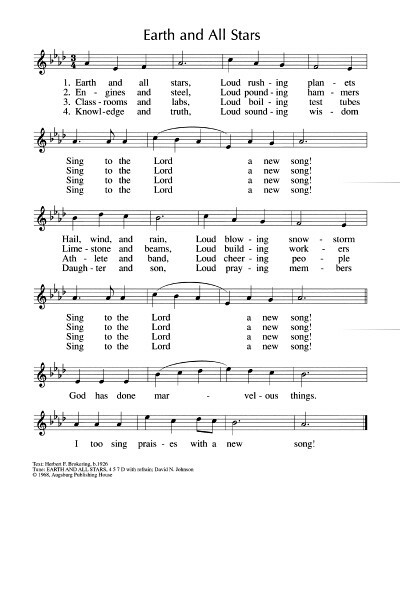 *CH753 / SFFS 2078 / GtG589 / GC(II)271 / G(3)338 / PfAS147A Alleluia alleluia (Honduras) Simple and fun Alleluia that works well as a refrain for a reading of this Psalm. You could also use a different Alleluia. *AoVK-24 / Iona (T1AU) / CH756 Bless the Lord / My sisters (Kenyan) Simple and fun Kenyan call and response. "Bless the Lord there is no other God" Kids would really enjoy this, and with some African drumming, it would really be excellent. Good for kids. Iona (SBL) / CH140 / MV181 / WoV727 / ELW554 / G(II)341 / GC495 / STB178 Lord Your Hands Have Formed This World / The Earth is the Lord's (Oliano) Good words of creation to a lovely, and not too difficult, Philippino melody. This would be a nice song for a children's choir or for the offering. Lyrics and sample sheet music. 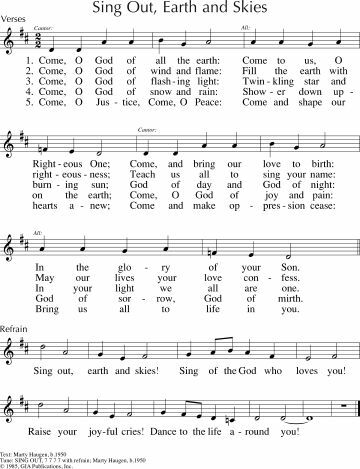 CH753 / SFFS 2078 / GtG589 / GC(II)271 / G(3)338 / PfAS147A Alleluia alleluia (Honduras) Simple and fun Alleluia that works well as a refrain for a reading of this Psalm. Good for kids. Wisdom, rescuer of the Israelites. *MV010 / GtG174 / URW099 Come and seek the ways of wisdom (Duck) This song is about the personification of Wisdom, and would work very well as a gathering song in the context of this reading. Tune is joyful, but not familiar, so if it seems difficult, you could sing the same words to PICARDY (TiS 497). Lyrics. *MV187 / ELW682 We give our thanks / Reamo leboga (Traditional Botswana) A great song to sing for the offering. Sound sample (scroll to the 3rd album). We usually sing it much more quickly than this sample. Good for kids. AoV2-037 Children Of God in one family (Walker) Great for kids. Sometimes we mess up, but God forgives. Good for kids. AoVK-119 We're God's family God's children (Watts/O'Brien) Good words. Catchy tune. Good for kids. *TiS 465 / AHB 399 / ATA 115 / NCH279 / A&M271 / Iona (SBL) / CH116 / GA381 / Lau313 Our God in heaven / Father in heaven / Loving Creator grant to your children (Maquiso / Niles) I really like this hymn, especially the Philippino folk melody to which it's set. 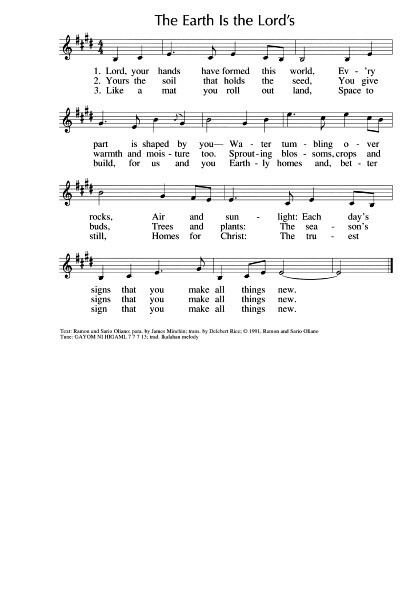 Newer versions of the hymn from the Christian Conference of Asia have altered the lyrics to "Our God in heaven / Creator God" in the first verse. Other versions, such as CH4 have "Loving Creator / Parent and God". *MV157 I am a child of God (Harding) A simple song with powerful words. Good for kids and adults alike. Very easy to learn. Good for kids (just the first verse probably). *TiS 163 / AHB 112 / NCH556 / UMH150 / LBW463 / ELW771 / GtG024 / PH268 / W&R644 / Cha651 / URW084 / 82Hml-580 God who stretched the spangled heavens Good words of creation of nature and cities and creative possibilities for the future. AHB has a Father and old language, but it works okay; TiS and other sources are better. There are many possible tunes. I like it best to HOLY MANNA as in the link. Lyrics and sound sample. NCH072 / UMH552 / VU362 / ELW530 / GtG311 / PH465 / CP534 / W&R597 / Cha278 Here O Lord Your Servants Gather / Sekai no Tomo (Yamaguchi) Beautiful song about being a community of faith seeking strength and courage. Lovely simple Japanese tune. The story of this hymn. Lyrics. TiS 428 / AHB 340 Help us O Lord to learn Great challenging (but quite formal) words about being committed to learning the faith. Good for a New Year message. Boring tune though. I would sing it to ST THOMAS (TiS 271 / AHB 198) Lyrics (with thees and thys, which are not in TiS). *Tune In: Community (Brown) A great and very easy-to-sing contemporary song about being welcomed and part of a community. Sound sample, lyrics, songbook. Again, Christmas Carols and Epiphany songs would fit well for this. NCH164 / VU79 / StS030 / WoV652 / LBW652 / ELW314 / PH411 / GtG744 / W&R231 / URW138 Arise your light is come! (Duck) Good general words of Christ coming to bring justice to the familiar tune ST. THOMAS (TiS 271). STB047 Sarennam (Dyvasirvadam) This song from India will need to be taught, but I think it's worth it. Quite nice; the English translation is very poetic. VU886 / SFFS 2005 Arise Shine for your light has come (Smith) A simple call and response. Good for an intro to worship. This would be great for the whole Christmas season. *Music by Heart 61 Arise shine for your light has come (Cunningham) A simple two-part chant, which can easily be taught before, or during, the service. We used this last year. GtG467 / STB058 Give Us Light / Jyothi dho Prabhu (Vas) This song in Hindi or English is simple and repetitive and could be sung in either language (with a little teaching time). You could sing all 5 verses or just a few. It might also work during Advent as a candle lighting song. *TiS 156 / AHB 91 / AoV1-135 / ATA 123 / CH212 / UMH145 / VU409 / ELW556 / GA537 / A&M545 / HPP267 / GtG664 / PH469 / G(II)546 / GC756 / GC(II)748 / G(3)855 / CP003 / W&R35 / Cha053 / URW186 / 82Hml-008 / Lau671 Morning has broken (Farjeon) This song makes me smile every time. Here's Yusuf Islam (when he was Cat Stevens) in 1976 (love those green boots). *TiS 447 / AHB 61 / CH112 / VU313 / LBW400 / ELW673 / A&M810 / CP560 / CP(E) 267 / 82Hml-371 / Lau887 God whose almighty word / Lord your almighty word chaos and darkness heard / Thou, whose almighty word A good hymny hymn, very familiar, with the memorable “Let there be light” line at the end of each verse. TiS lyrics are fairly inclusive, but VU is better. Older style lyrics and sound sample. TiS 477 / Iona (LFB, Common Ground) / CH510 / StJ / GA529 / A&M450 / CP059 / SP218 / URW056 Jesus calls us here to meet him. Good words and a rollicking or gentle Celtic tune (depending on how you play it!). Lyrics (downloads PowerPoint slides) 4th verse (not in TiS, but in Iona sources) leads to communion. GA461 / G(II)445 / GC629 / GC(II)608 / G(3)699 God Is Love and all who live in love live in God (Haas) This is a nice cantor and refrain piece. The refrain is very simple and the cantor part is inclusive. The words are really good. Slowish sound sample. WoV768 / ELW737 / CP456 / W&R412 He comes to us as one unknown (Dudley-Smith) Great words to a very familiar hymn tune (REPTON). W&R104 / URW102 Hidden Christ Alive for Ever (Wren) Wonderful and inspiring words of Christ in all things. Can be sung to HYFRYDOL or HOLY MANNA, so would be easily sung by most congregations. A good song for just after the sermon. Lyrics and sheet music. StS028 / WoV638 / A&M067 / G(II)275 / GC369 / GC(II)354 / G(3)443 / W&R199 / Lau148 Holy Child within the Manger (Haugen) Lovely words and a simple gentle tune. Lyrics. Iona / CH317 / CP621 Before the world began (Bell/Maule) Excellent words from John Bell. *AoV2-060 / SFFS 2172 / HPP307 / GtG749 / G(II)518 / GC718 / GC(II)710 / G(3)807 Come live in the light / We Are Called (Haas) Joyful song of mission. I love this! Lyrics, sheet music sample and slowish sound sample here. I would double the speed of this (almost). AA016 Christ is our peace (Murray) Wow. This one is excellent. Would also be good for the offering. Very simple Irish traditional tune. *CH348 / StS001 / LBW196 / ELW843 / CP397 / W&R93 / SP304 / URW090 Praise the One Who Breaks the Darkness (Edwards) Good words of Christ's ministry to all. Can be sung to the familiar tune NETTLETON, or the less familiar and very lovely tune JOEL. Lyrics.